Every day arjitha sevas are performed to the presiding diety of the Lord venkateswara swamy as a matter of divine exercise and also allows pilgrims as partners in the exercise as a token of involvement of the devout service. Devotees who wish to attend the particular seva will have to contain the seva tickets which are made available in the website before four months of the date. Pilgrims have to book the tickets and attend the seva. Then how to book the Arjitha seva tickets through online and how to check the availability of the seva. In this we provide you the information about how to book the TTD Tirumala temple seva tickets, ticket cost and timings of this seva. How to Book Tirumala TTD Seva tickets online? The below are the steps to follow to book the tickets for TTD seva tickets booking through online procedure. To book the Arjitha seva tickets through online, first of all you have to open the official website of the TTD online portal. Then the home page will be displayed on the screen. In that on the left side of the page click on the seva option. 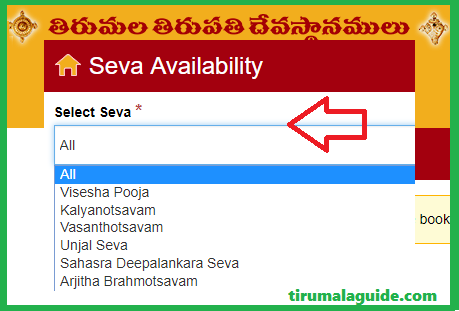 Select the seva which you want to perform from the drop down list. Then it will show the calendar from the date to three months. In that check the availability on possible dates, here green indicates the availability of tickets, red indicates that already filled. If there is availability for your expecting date then go for booking. For that login to your TTD seva account by using login credentials, if you did not have an account then register with the website first and then proceed to login. After that enter all the required details and upload the scanned documents which are required and click on continue. After filing all the details you are directed to the payment gateway, fill the card details and click on the proceed option. After the success full payment for the seva tickets you will get the confirmation message to your registered mail and phone number. By this you can book the tirumala sri vari seva tickets through online. While coming to the seva you have to come along with the print outs of the ticket. Tirumala Tirupati Devasthanams had made avail of current booking of seva tickets, one can get these current booking seva tickets at TTD Counters, Kalyanamandapams and post offices near by your area. But these are limited quantity. The prices of Arjitha seva tickets are as follows. The timings of this arjitha seva is different to one another. The important point is that devotees who are attending the seva will come in tradition dress only. Men with shirt and dhoti/white pancha.